On November 15th, 2007, the “Atlantic Pilot”, was christened in Halifax by Mrs. Debbie Aldrich, wife of Brad Aldrich, President and Refinery Manager at the North Atlantic Oil Refinery in Come-by-Chance, NL. 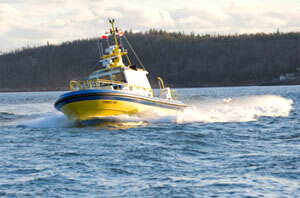 The “Atlantic Pilot” joined her sister vessel “Avalon Pilot” in Placentia Bay, NL by the end of November. These vessels feature a hull design by Camarc Ltd of the United Kingdom, with the remaining design work completed by Lengkeek Vessel Engineering (LVE) of Dartmouth, NS. The construction is by the A.F. Theriault & Sons Ltd, a shipyard located in Meteghan River, NS. Each vessel is being built to Lloyd’s Classification Standards, with the project management undertaken by LVE.